Average Height	: 7" - 12"
Average Weight	: 4 - 7 lbs. Non profit 501(c)(3) organization for Pomeranian’s, Senior Breeds and Cats in need. Pomeranians got their name from the region of 'Pomerania', an area between Germany and Poland. Documented history about dogs show that "Pom's", as they are often called, were developed via the ancient Spitz breeds. Original Pomeranians were much larger in size, weighing in well up and over 30 pounds. Initial documents about the Pom's show that they were developed to work with Sheep herders, partnering with their Master's in herding responsibilities. Marie Antoinette, Emile Zola, Mozart and Queen Victoria all owned Pomeranians. The British Kennel Club, with a nudge from Royalty initiated them into their books, and officially recognized the Pomeranian in 1870. In 1888 Queen Victoria began breeding and showing these dogs. It was Queen Victoria who started breeding Pomeranians down in size, and it was during her reign that the breed gained popularity throughout England. They may be small but make no mistake, this breed has talents:Some of the Pom's make great watchdogs, do well in dog sports like Agility and love to perform tricks. There is a famous story about a Pomeranian that Queen Victoria owned. She had been to Germany on a visit when she saw her 1st Pomeranian and brought him back to England with her. When she was dying, she asked that her favorite dog "Turi" the Pom be set beside her. She died with Turi at her side. Poms love of learning and athleticism was easily seen and animal trainers in circuses recruited them to perform in travelling circuses throughout Europe in the 19th and early 20th centuries. •	Proud, lively little dog. •	Intelligent, eager to learn, very loyal. •	Docile temperament and affectionate. •	Alert, inquisitive and active. •	One of the most independent of the toy breeds. •	Needs firm, gentle disciplined training. •	Can be picky eaters. •	Can get along with other dogs, if introduced properly. •	You need to be firm if they develop excessive barking nature. •	Teach it early to only bark a couple times when the doorbell rings. Control it's barking nature. •	Brilliant little guys, Poms love to perform & learn to do tricks. •	Poms bond closely to their owners and don't suffer being left alone well. They are quick to suffer from separation anxiety if left alone for long stretches of time. •	Can become willful, nervous, bold and temperamental, and are known to take on larger dogs if provoked. •	Can be reserved with strangers, barking at them excessively, growling, snapping and biting. •	Not recommended for children. •	Good companion dog for elderly people. •	Long, double coat, needs frequent brushing. Pomeranians are extremely intelligent and extroverted. They are very spirited dogs, and do well with spirited owners. They prefer a lot of interaction with their owners, which is why they are often used as companion dogs for single people. Due to the dog's small size, they are easy to transport, and love going everywhere with their humans. Pomeranians tend to be very willful and dominant in their personalities, so early training is critical. They are somewhat cocky, and often will not hesitate to take on a dog that is four or five times their size, as they seem to have no recognition of how small they are. Because of these tendencies, training your Pomeranian thoroughly and at a young age is critical. They are independent and curious and are usually happy and alert dogs. They are full of energy and active, but since they are so small, they are not usually a nuisance. They love to do tricks and bond well to their owners, but are not typically overly clingy. They don't like to be left alone for long periods of time, so this is not necessarily a good breed for the family who is gone all day long. Pom's can do well with other pets in the home, but they should be introduced early, since this breed has a tendency to be very dominant. Pomeranians are prone to several different Health Problems. The most notable problem is early tooth loss, which is quite common in this breed. To prevent tooth loss, feed your Pomeranian a Diet of dry dog food to help keep his teeth and gums in good condition. In addition, it's important to have your Pomeranian's teeth cleaned professionally once a year. Pom's can also be prone to eye and skin infections and some lines are prone to dislocated knee caps and Slipped stifle. The Pomeranian requires a fair amount of grooming. They are constant shedders and their long coats must be brushed frequently to keep them from getting tangled and matted. In addition, regular brushing helps prevent dandruff, which can be a problem with Pomeranians, and leads to itchy skin. However, if you brush the Pomeranian properly, starting at the head, parting the hair and brushing it forward, it will fall right into place. Pomeranians are very heavy shedders, so brushing them every day will also help you keep the hair at bay. Their eyes and ears should be cleaned daily, as they are prone to infections, and their teeth must be regularly cared for by the veterinarian, as well as receiving daily, or at least weekly, brushing at home. Feeding them dental treats and vitamin treats can help with their tooth problems, too. When you need to shampoo your Pomeranian, dry shampoo works best, as regular shampoos can cause the dog to lose the natural oils in his coat. If you must shampoo with wet shampoo, keep shampooing to a minimum and be certain to use a mild shampoo especially formulated not to dry out the hair and skin. Since Pomeranians are prone to dry itchy skin, it's important to keep their natural oils intact. 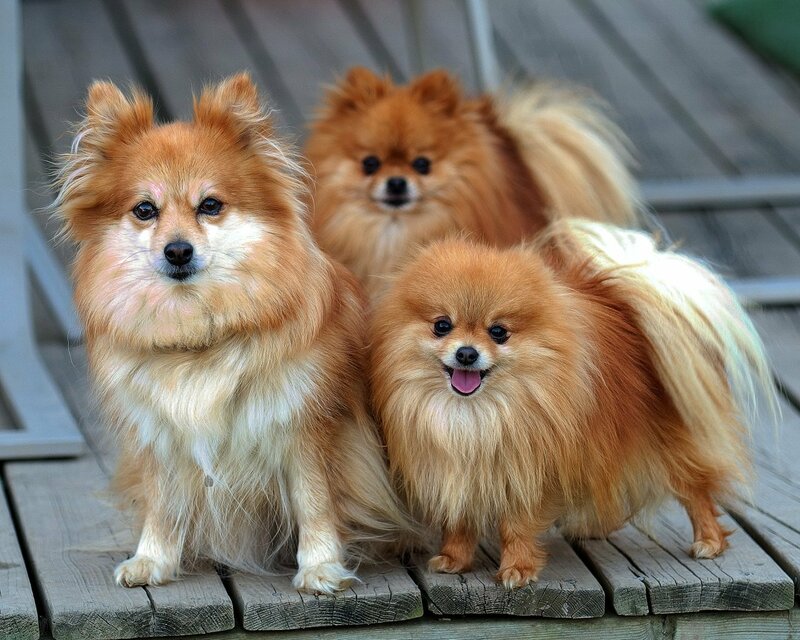 Pomeranians need a moderate amount of exercise, but can get what they need from running around in the house. They also love to walk, and can get sufficient exercise by just going on a daily walk with their owner. Though they are small, they can go on long walks without becoming overly tired. You'll find that this breed is energetic, but at the same time does not need a significant amount of exercise. The Pomeranian can be quite a willful and dominant dog, so training must begin early and must be consistent. It's very important that your Pomeranian knows that you're the boss. If this fact is not established early on, this breed can become very demanding and possessive of their owners and will refuse to listen to even the simplest commands. It is also important that these dogs are socialized early on to prevent them from being overly suspicious of strangers. Spend plenty of time working on appropriate and inappropriate barking, as Pomeranians are known to be excessive barkers when not properly. It is imperative that your Pomeranian be taught not to be underfoot. Because of their small size, a Pomeranian can be seriously injured if he is stepped or sat on. They love to sleep under blankets and pillows, where they can be difficult to detect and easy to sit on. In addition, a Pomeranian can seriously injure himself or even kill himself if he jumps out of your arms or off the back of a high couch. Pom's are notoriously hard to housebreak. Because they are so small, they can sneak off to any little corner and go to the bathroom without you ever knowing it. And, of course, once they've gone in the house, the pattern is established. This is one breed for which crate training is absolutely necessary. They should not be allowed to roam the house unsupervised for many months, until their bodies are mature enough to hold their urine and they are well trained enough to understand the appropriate places to go. However, these dogs are very intelligent, and with the proper training, can be taught to do nearly anything they need to do. They love to do tricks and can be quite proficient at them. Pomeranians are very curious and inquisitive. This makes them somewhat easy to train, but does mean that you'll need to train them in a place where they can be focused, with few distractions. Once properly trained, Pomeranians are suitable for many types of tasks. Because their energy level is high, they can be very hard workers. In the past, Pomeranians have been used for search and rescue dogs, particularly in post earthquake searches, where small dogs are needed to locate survivors. In addition, they are often used as the therapy dogs for the elderly and ill. Finally, they can be trained to be used as companion dogs for the hearing impaired.